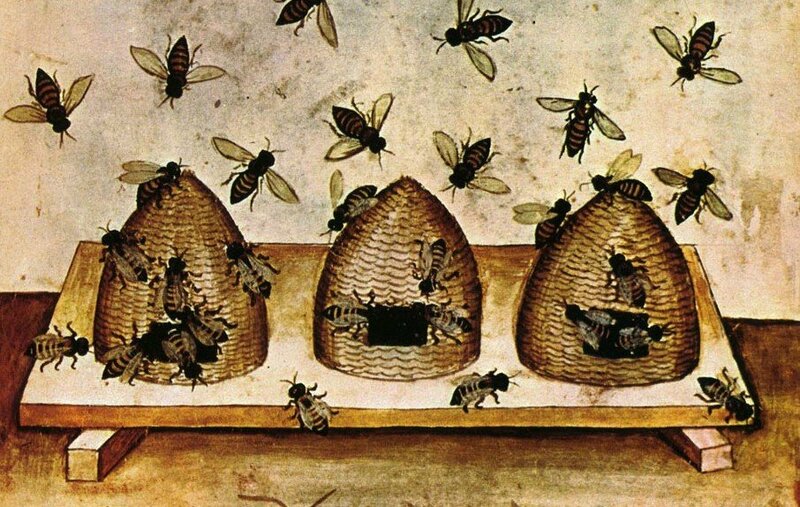 Beekeeping has been a practice going back to ancient times, and during the Middle Ages one could find many farms that kept beehives and collected honey. However, few medieval texts offer indepth information on how this was done. One text that does detail beekeeping is the Geoponika, a 10th-century Byzantine work on farming. A collection of selected writings from ancient and Byzantine writers, the work includes a chapter bees and beekeeping. The bee is the wisest and cleverest of all animals and the closest to man in intelligence; its works is truly divine and of the greatest use to mankind. Its social life resembles that of the best regulated cities. In their excursions bees follow a leader and obey instructions. They bring back sticky secretions from flowers and trees and spread them like ointment on their floors and doorways. Some are employed in making honey and some in other tasks. The bee is extremely clean, settling on nothing that is bad-smelling or impure; it is not greedy; it will not approach flesh or blood or fat but only things of sweet flavour. It does not spoil the work of others, but fiercely defends its own work against those who try to spoil it. Aware of its own weakness, it makes the entrance to its home narrow and winding, so that those entering in large numbers to do harm are easily destroyed by the guardian bees. This animal is pleased by a good tune: when they are scattered, therefore, beekeepers clash cymbals or clap their hands rhythmically to bring them home. This is the only animal that looks for a leader to take care of the whole community: it always honours its king, follows him enthusiastically wherever he goes, supports him when he is exhausted, carries him and keeps him safe when he cannot fly. It particularly hates laziness; bees unite to kill the ones who do no work and use up others’ production. Its mechanical skill and near-logical understanding is shown by the fact that it makes hexagonal cells to store honey. If there is a need to move them, at the demand of a purchaser or for some other reason, it must be done gently and during the night; the hives should be wrapped in skins; they should be set in place before dawn. When it is done in this way the combs will not be damaged and the creatures will not be injured. As food for young bees put out wine mixed with honey, in basins, and in these place leaves of many-flowered savory so that they do not drown. To feed your swarms in the best possible way whenever they stay at home because of wintry weather or burning heat and run out of food, pound together raisins and savory finely and give them this with barley cakes. When the first ten days of spring are past, drive them out to their pastures with the smoke of dried cow-dung, then clean and sweep out their hives: the bad smell of the dung disturbs them, but cobwebs are an obstacle to them. If there are many combs in the hives, take away the worst, so that they are not made unhealthy by overcrowding. The Geoponika recommends that honey be harvested three times per year: the beginning of May, then in summer, and finally around October. One should not take away all the honey, otherwise “the bees are angry and stop working” but leave 1/10th of the produce during the first two harvests, and 2/3rds before winter. Take flour of roasted fenugreek, add the decoction of wild mallow with olive oil so that it has the consistency of honey; anoint the face and bare skin with this thickly, take it into the mouth and blow into the beehive three or four times. It should be translucent and pale yellow in colour, smooth to the touch, remaining in a long string when pulled, readily raised to a point and slow to sink back, thick when it reluctantly separates; and it should have a good aroma. Geoponika: Farm Work, has been translated by Andrew Dalby in 2011. You can learn more about it from Prospect Books. Andrew Dalby has written several books and articles related to food and classical history. Click here to go to his website.